The University has announced a major investment in the research infrastructure for digital humanities and digital cultural heritage, with a new image viewer for The University of Manchester Library’s Special Collections, to be developed and built in collaboration with experts from Cambridge University Library’s Digital Library team. The image viewer partnership has been led by Dr Guyda Armstrong, Faculty Lead for Digital Humanities, in close collaboration with colleagues from The University of Manchester Library, the John Rylands Research Institute, IT Services, and academics from the School of Arts, Languages and Cultures working with the collections. The new image viewer will allow enhanced viewing and manipulation of ultra-high quality images, with a parallel display of text, audio, and even video content. With its functionality permitting the presentation of extensive research content alongside the images, the new viewer will allow University of Manchester academics to curate digital editions of important items from the collections, contextualizing them and bringing their research on the collections to a wider audience. The new image viewer supports the IIIF image standard, which permits interoperability with other institutions’ image collections, while the metadata uses TEI XML, the gold standard of digital humanities object description. 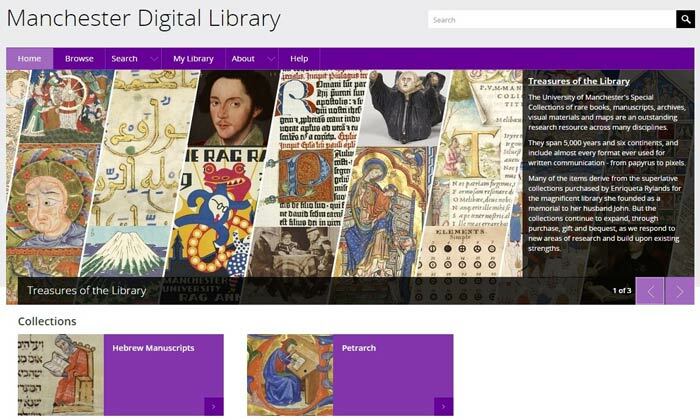 The University of Manchester research image viewer is the first formal external partnership of Cambridge University Library, and represents an important strategic collaboration for both institutions. While The University of Manchester Library and Cambridge University Library have already collaborated on a number of large shared image collections projects for a number of years, the creation of the new image viewer will allow us to deepen the relationship and embark on further joint special collections and digital humanities projects. The image viewer project is supported by the Creative Manchester initiative, and the University’s Research Lifecycle Project, which is a five-year programme of investments to support the University in meeting its goal of being one of the top 25 research universities in the world, through a series of strategic investments in IT and associated change. Tuan Pham, Programme Director – Digital Transformation for Cambridge University Library said: “Since 2010, the Cambridge University Library’s Digital Library platform has been a core part of our mission to provide access to world heritage collections, to collaborate with partners to share the benefits and maximise reach and impact, to engage people and inspire thirst for knowledge and understanding. We have shared many of our wonderful collections at Cambridge to everyone, to thousands world-wide. Now we are very proud and excited to partner with the University of Manchester, to be part of this transformative investment, bringing to light the special collections at Manchester for everyone to study, research and enjoy.